It’s always a pleasure to review any Net Entertainment slot and when it’s as brand new and hot off the press as Magic Portals it’s an extra bonus. Net Ent’s more recent slots have a habit of introducing elements to the game that are genuinely original and this is no exception. The graphics and animations are of the usual high standard and the sound effects are a treat. 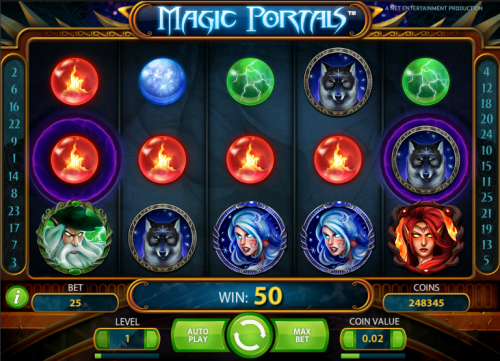 Magic Portals is a five reel and twenty five payline online slot with a theme of magic and mysticism; the portals of the title contribute to the game’s bonus features and all the symbols are related to theme somehow. So from low to high value we have blue, green and red crystal spheres, a wolf, an owl and a dragon; the more valuable symbols are a blue-haired witch, a white-bearded wizard and a red-headed witch. There’s also a wild symbol labelled ‘Wild’ and a free spins symbols labelled ‘Free Spins’. Net Entertainment have a tradition of including a bonus feature in the base game of their slots and that’s what we have here – on reels one and five you will notice electrically charged purple circles. If you can land matching symbols in these circles they will become wild, along with every other occurrence of that symbol in view; this can obviously reward you with some pretty decent payouts. The free spins are also activated using the portals. This bonus round is triggered by landing two of the free spins symbols in the magic portal circles; you’ll then be rewarded with ten free goes but there’s an extra bonus here – all places on reel five will become portals, meaning that the symbol on reel one can match any of the three on reel five, making a match (and therefore a big win) far more likely. Magic Portals easily lives up to this company’s high standards; everything about it is addictive and you’ll never tire of watching the electricity arc from symbol to symbol when you land a magic portal win.